Musicians jammed at Allston’s Herter Park Amphitheater with an audience seated in front, yet the mission of the night extended beyond celebrating music. Boston-based nonprofit Climable organized the night to create good vibes and positive intentions around fighting climate change. 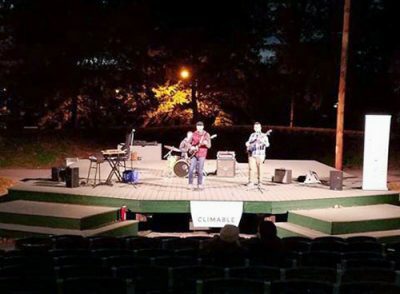 The celebration, held Friday night, was Climable’s first annual green energy concert, titled Climapalooza. The concert served as a fundraiser for the nonprofit and focused on spreading the word about Climable as a nonprofit committed to clean energy and climate science. The event featured jazz musicians from Berklee College of Music, local pop, punk and alternative bands, a silent auction, electric vehicles on display, educational demonstrations and speakers about climate science and clean energy. Climapalooza was advertised as a green energy concert, as all of the energy consumed during the concert was matched with local wind power by Green Energy Consumers Alliance. Climable founder and Executive Director Jean Ann Ramey called the concert an Intergovernmental Panel on Climate Change recovery party and said the focus was on what could be done rather than what people can’t do in regard to climate change. An IPCC report published this month revealed the drastic effects a 1.5 degrees Celsius increase in global warming would have. This report inspired Climapalooza as an event focused on raising awareness about climate change and clean energy. “The event itself talks about the IPCC Report and what it means,” Ramey said. Ramey said the goal was to make the information easy to understand so the general public was informed, as accessibility is also the basis of Climable as an organization. “It makes a huge difference if people have information that is easily understandable, meaningful and true about climate change, the impact that everyday decisions have on the climate and how to vote,” Ramey said. She explained that Climable was formed out of the idea that the public would benefit if they could access technical information in a plain format. The more people are aware of problems and issues in their community, Stevenson said, the more they can realize they need to speak up and talk to their elected officials. Climable currently has two Boston University student interns supported by the Massachusetts Clean Energy Center, or MassCEC, which provides funding to clean energy organizations. Belle Zhang, a senior in the College of Engineering and an intern at Climable, said her internship experience has been valuable. “It’s the best part of my semester right now — and not just because the office has unlimited snacks,” she said. BU students would benefit by attending Climapalooza, she said. Kyle Schultz, a senior in the College of Arts and Sciences, interns at Climable, where she said her time there has challenged her. Schultz explained when preparing for Climapalooza, she worked to spread the word about the event and hoped many BU students would attend. Sean O’Connor, a junior in the Questrom School of Business, said the event sounded interesting and that his only deterrent from attending would be the World Series Red Sox game, which was occurring at the same time. CORRECTION: A previous version of this article misstated groups’ names and the conclusion from the IPCC report. An updated version reflects the correction.